Galway East Tourism - Red Oak Restaurant in East Galway, West of Ireland.Galway East Tourism - Red Oak Restaurant in East Galway, West of Ireland. Pretty cottage restaurant with open fires, good food and friendly service. Just a ten minute drive from Portumna, and can also be accessed from the adjoining marina. 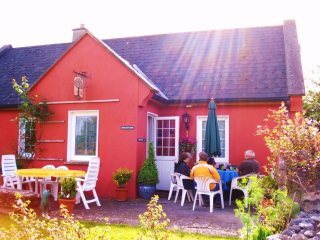 Anne Hilty's pretty cottage restaurant near the marina (Clondavaun Bay) has a loyal following. Printed menus offer a wide range of simple dishes, all fresh from the kitchen and of the highest quality. Everything is prepered fresh every day, and given adequate notice you can have virtually anything you like; local meat from butcher, fresh fish, fresh garden vegetables or try some of our swiss dishes. If you like later you can have a walk around clonmoyland grounds down to the lake or just enjoy a coffee at the fire : its your choice. Ring well ahead to book.